In a 1946 Atlantic Monthly essay, Jean-Paul Sartre writes: The greatest literary development in France between 1929 and 1939 was the discovery of Faulkner, Dos Passos, Hemingway, Caldwell, and Steinbeck. When Ernest Hemingway arrived in Paris in 1922, he was an unknown writer from America. The City of Light was where he learned his craft and gained legitimacy. Although much has been written about Hemingway's apprentice years in Paris, little has been published about his literary convergences with French writers. In Hemingway and French Writers, Ben Stoltzfus illuminates the connections between Hemingway and the most important French intellectuals, such as Gustave Flaubert, Marcel Proust, Andre Gide, Jacques Lacan, Jean-Paul Sartre, Henry de Montherlant, Andre Malraux, and Albert Camus. A distinguished scholar of both French literature and Hemingway studies, Stoltzfus compares Hemingway's major works in chronological order, from The Sun Also Rises to The Old Man and the Sea, with novels by French writers. While it is widely known that France influenced Hemingway s writing, Hemingway also had an immense impact on French writers. Over the years, American and French novelists enriched each other's works with new styles and untried techniques. 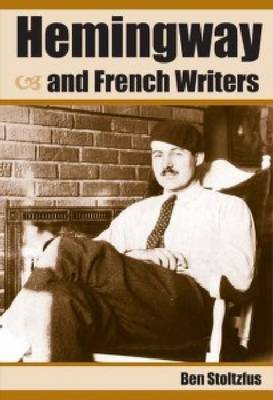 In this comparative analysis, Stoltzfus discusses the complexities of Hemingway s craft, the controlled skill, narrative economy, and stylistic clarity that the French, drawn to his emphasis on action, labeled le style americain.